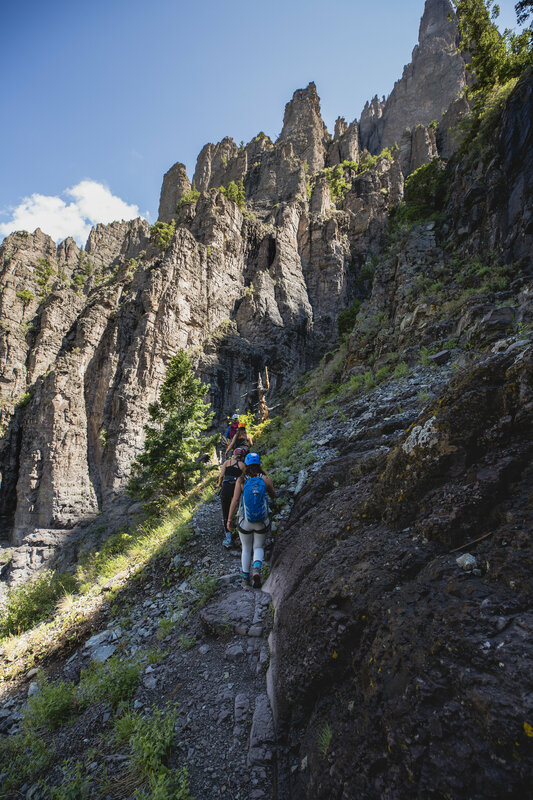 For a breathtaking, unique adventure, look no further than the Telluride Via Ferrata. The route precariously traverses rock faces up to 600 feet above the forest below, exhilaratingly exposed in sections that would be impassable without the steel cables and scattered steel holds along the way. 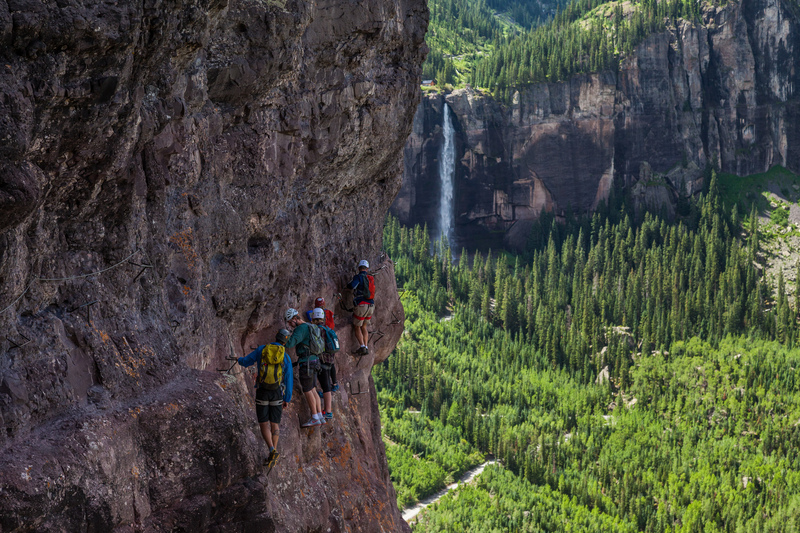 The Telluride Via Ferrata provides unmatched views of Bridal Veil Falls (the highest free falling waterfall in Colorado) the town of Telluride far below, and the surrounding peaks of the San Juan mountains. Think of it as a hike along a sheer cliff, with steel rungs to hold onto when the going gets steep. 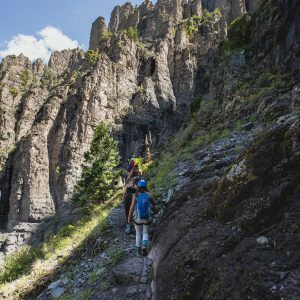 This guided service of Telluride Via Ferrata is a perfect adventure for visitors of a wide range of abilities, albeit not particularly for those who have a fear of heights. “Via ferrata” is Italian for “iron way.” The original via ferratas were developed during WWI on the Italian and Austrian border to move troops through exposed, high-mountain terrain. 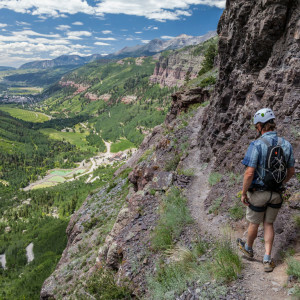 Here in Telluride, our Via Ferrata allows access to amazing alpine vistas and stands as a tribute to its visionary, the late Chuck Kroger, a local climbing legend. 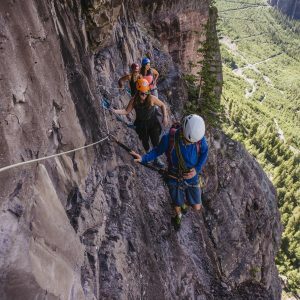 Bring the whole family for a five-star day trip or to add to the challenge by taking a direct, multi-pitch rock climb to join the Via Ferrata. This option adds some real technical climbing for those looking for a bit more of a challenge. Whichever variation you choose, our experienced and highly trained guides will ensure an enjoyable and memorable experience. 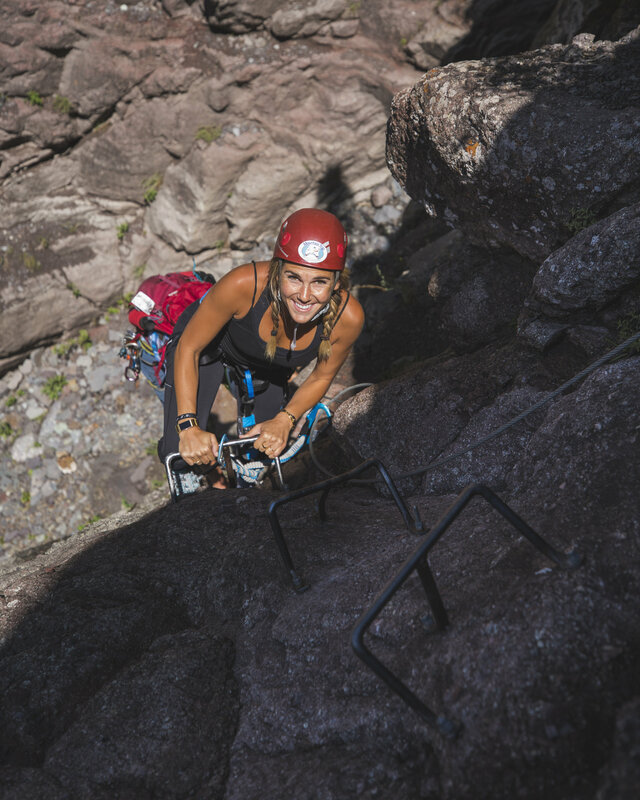 Mountain Trip provides all technical equipment necessary to traverse the route, including, helmets, harnesses, and specialized, load-limiting Via Ferrata lanyards. 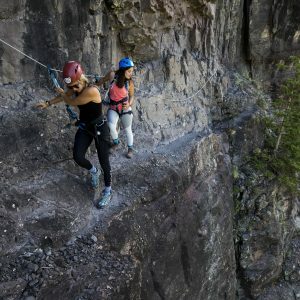 The Via Ferrata is a serious undertaking that affords climbers a unique and spectacular way to experience the high country of southwest Colorado. This route has increased in popularity a lot in recent years, to the point that our local US Forest Service is not quite certain how to manage use on it. In an effort to help, we are only offering full day, one-way trips, starting at the east end and traversing to the west. This should help reduce our impact on the route, and limit the times we might have to pass other parties, which we feel makes for a better experience. The Via Ferrata will take 4-6+ hours and we will do the entire route from east to west, descending off the route on a hiking trail. The western half of the Via Ferrata is the most serious, with many sections of rungs and some very exposed hiking along a narrow trail with nothing but air off to your side. We will probably encounter other parties along the way, and by completing the route in one direction, we hope to minimize those encounters and mitigate the risks involved with passing other parties on precariously small ledges. ***We do not offer “Half Day Trips,” as these require parties to retrace the route, doubling our impact on the route and creating potentially increased risk for our teams and for others enjoying the route. Does the route require previous climbing experience? Not at all. 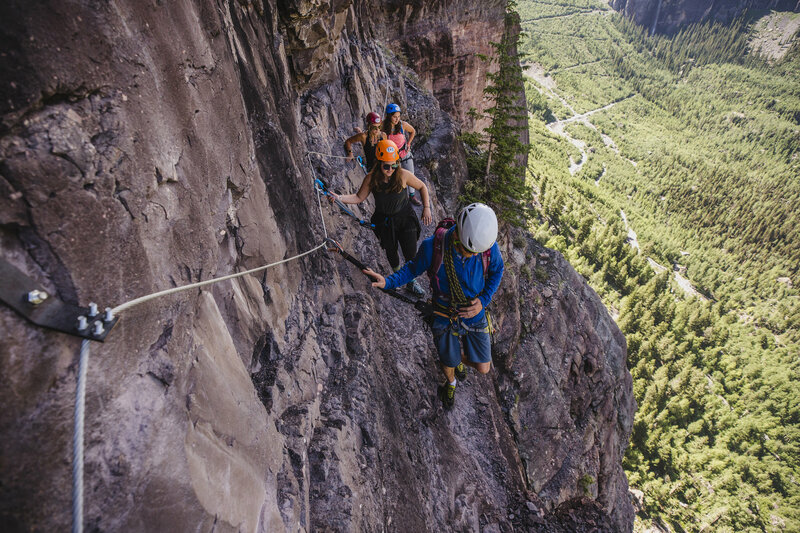 The original Via Ferrata were built to allow those with no technical climbing experience access to big, high mountain terrain on sheer cliffs. 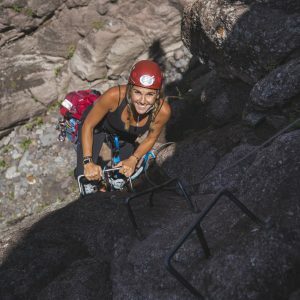 As long as you are comfortable with a bit of exposure and don’t have an overbearing fear of heights, then you will have a great time on the route and will have no problems. How long will the Via Ferrata take and how far is it? The route in its entirety, traversed east to west, will take at least four to five hours round trip from the town of Telluride. We traverse the route from east to west, and hike out on a short section of trail back to Bridal Veil road. The total distance is around two miles. Is the route appropriate for my young children? While we used to have an age limit of 13, we’ve had countless youngsters impress us on the route. We do require that families or groups with young children book a private trip. While young children will have problems with some of the reaches, as long as they are able to pay attention, walk carefully and take coaching from the guide. What is the difference between open and private trips? On a private trip, you will be just with your group and your guide; meeting time and pick-up are up to you. With an open trip, you will be joined by other climbers at no more than a 4:1 climber to guide ratio. Do you have “open” via ferrata trips scheduled and departing each day? No. Open trips have to be booked by at least a party of two to be scheduled for a particular day. In other words, there is not an open trip scheduled for a certain date until someone books. How can I register other members of my group? The online sign-up only takes information for one person. The way our online registration is organized, we only require information for the “trip leader,” or the person registering on behalf of the rest of the party. If there is anything in particular that you think your guide should know in advance about particular members of your party (ie: medical conditions, prior injuries, fear of heights, apprehension, younger than age 14, etc.) please list that in the notes section or let us know in the office. Is transportation included? Where can I park? In our rates, guide gratuity is not included. Typically, if you had a good experience, 15-20 percent of trip cost is greatly appreciated by your guides. Of course we pay them a liveable wage, but guiding is typically a tip-augmented profession. Yes. We offer a ten percent discount for active-duty military on all of our Via Ferrata trips. If we cancel the trip due to weather, we will refund you in full. If the weather is less than desirable but does not affect safety or augment risk, the trip will still run. We will not issue refunds for trip cancelled within 48 hours of the scheduled departure time. Do you rent Via Ferrata equipment? Due to liability, we do not rent any technical climbing equipment, including Via Ferrata gear. If you would prefer to traverse the route unguided, you can purchase the necessary equipment at the local gear shop, Jagged Edge. 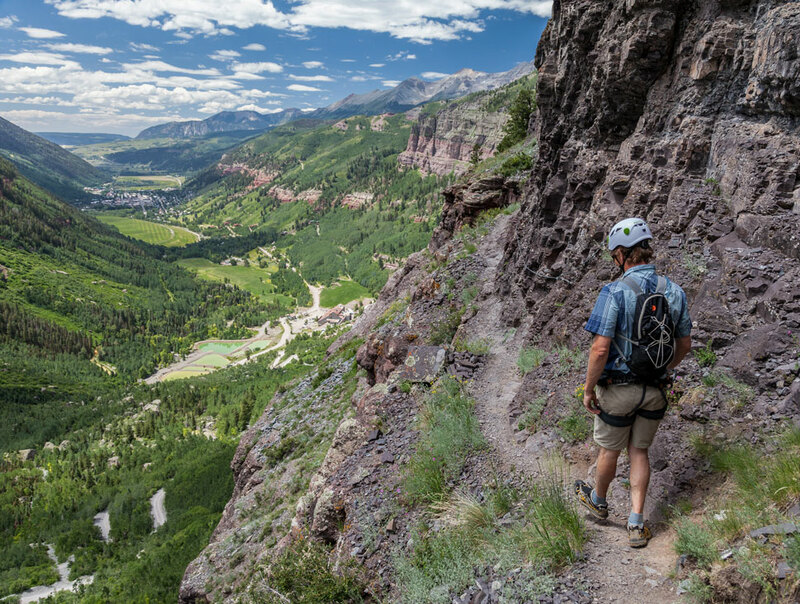 The Telluride Via Ferrata is an amazing adventure, but it should be taken seriously, as it is a true alpine endeavor. The following equipment is required to join us on this fabulous guided service, but please note that Mountain Trip will provide all technical equipment, including all helmets, harnesses, etc. Many of the items on the list need to fit you well in order for you to fully enjoy your experience on the trail. Please plan ahead with clothing and footwear purchased for your hike so you can be certain that your gear fits you well. Hanging from an iron rung is not the place to discover that your old raincoat is no longer waterproof or that your boots give you blisters. Please follow this list closely and do not hesitate to call us for clarifications or to solicit an opinion about any gear you are considering. We want to make sure you are as prepared as possible for your trip. Via Ferrata Gloves A thin pair of gloves will help keep your hands warm as the steel rungs and cables can be cold in the morning. Good dexterity is important for these gloves. We are happy to provide you with gloves if you do not have any with you. Small Pack Colorado Day Hikes Day hikes and the Via Ferrata require a small backpack or Camelback style hydration pack. It need only be large enough for a camera, water and light additional clothing layers for the day. [post_excerpt] => A thin pair of gloves will help keep your hands warm as the steel rungs and cables can be cold in the morning. Good dexterity is important for these gloves. We are happy to provide you with gloves if you do not have any with you. [post_excerpt] => Day hikes and the Via Ferrata require a small backpack or Camelback style hydration pack. It need only be large enough for a camera, water and light additional clothing layers for the day. Mountain Trip recognizes how difficult and disappointing it can be for guests who must cancel trips. Guests must also recognize that, due to the nature of planning trips and contracting guides for specific dates, Mountain Trip also accrues significant expenses in organizing our excursions. We must therefore adhere to a strict refund policy for all guests. • We require payment in full for all of our Colorado excursions in advance, unless otherwise discussed. Submission of payment constitutes your agreement to our Refund and Cancellation Policy. • Large parties (greater than six people) will be required to confirm the number of participants and make payment in full at least 30 days prior to the excursion. • Mountain Trip reserves the sole right to cancel an excursion prior to the departure date for any reason, including weather or route conditions. In such an event, all monies collected by Mountain Trip from team members for that climb shall be promptly refunded. This is the extent of our financial liability. We will designate a specific meeting time for your climb. Transportation to the meeting point is to be provided by you, unless otherwise arranged with Mountain Trip. This could mean you will need to arrive the day before, as it is often prudent to get an early start in the morning. Climbing and trekking can be very dynamic and we will provide you with a recommendation as to how you might best arrange your travel to SW Colorado. If flying, we suggest you book a ticket that allows you to change your flight with little effort or cost. Use our office staff and your lead guide as pre-trip resources to ensure that all your questions are answered. Travel insurance may help recoup expenses if you need to cancel a climb due to an illness. The Via Ferrata takes about 4-6 hours. 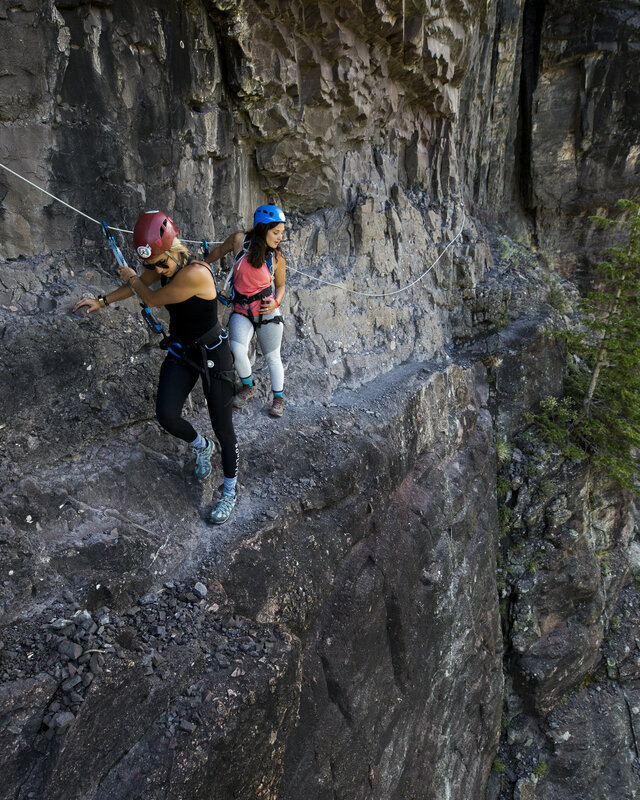 All outings are offered with the goal of completing the entire Via Ferrata, from east to west. If you have any additional questions, give us a call at +1-970-369-1153 or send us a note. Today’s via ferrata experience was phenomenal. It started with the reservation yesterday. I called for a last minute booking. The reservationist could not have been friendlier or more helpful. Last night, the guide (Jesse) called to confirm the details. This morning, I showed up 15 minutes early. Jesse was already there. The equipment was already set out. We were off to the via ferrata in no time. When we arrived, Jesse prepped me on safety/security for the morning. Throughout the day, Jesse gave helpful tips on how to maneuver the via ferrata safely. In addition, Jesse was very knowledgeable about mountaineering and Telluride. I learned a lot. The whole morning, Jesse went at my pace. The via ferrata course itself is great. Challenging, yet manageable. Amazing views throughout the morning. I had a great time and can’t wait to return with friends and family.